Californian's are hitting back at their new robot neighbors – literally – as reports detail assaults on driverless cars. Similar to the class-warfare rage against people waering Google Glasses, one recent incident involved a pedestrian crossing the street and striking the autonomous vehicle ‘with his entire body’, reports The Guardian. The great promise of self-driving cars is that they will save innumerable lives by removing the most fallible and unpredictable element from vehicle traffic: the human. But in San Francisco at least, human behavior is taking a stand. 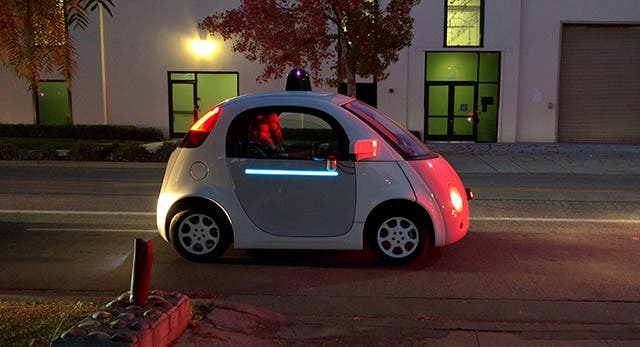 On 10 January, a pedestrian in San Francisco’s Mission District ran across the street to confront a GM Cruise autonomous vehicle that was waiting for people to cross the road, according to an incident report filed by the car company. The pedestrian was “shouting”, the report states, and “struck the left side of the Cruise AV’s rear bumper and hatch with his entire body”. No injuries occurred, but the car’s left tail light was damaged. The two human-on-robot assaults are not the first time San Franciscans have fought back – physically – against robots. In December, the local SPCA animal shelter removed its 400lb Knightscope security robot from the streets around its building amid backlash from residents and the homeless population who complained the robot was harassing them. While most residents simply complained about the robot’s presence, one person reportedly “put a tarp over it, knocked it over and put barbecue sauce on all the sensors”.